Back in March, a trusted source revealed to us that a Palm-branded Android smartphone was slated to launch on Verizon in the second half of 2018. We haven't heard anything since then, but a Palm device with model name 'PVG100' has just rolled through both the FCC and Wi-Fi Alliance. As is commonplace with these filings, much of the information and all photos are obscured at the request of the manufacturer. However, there's still a bit of information that can be gleaned. 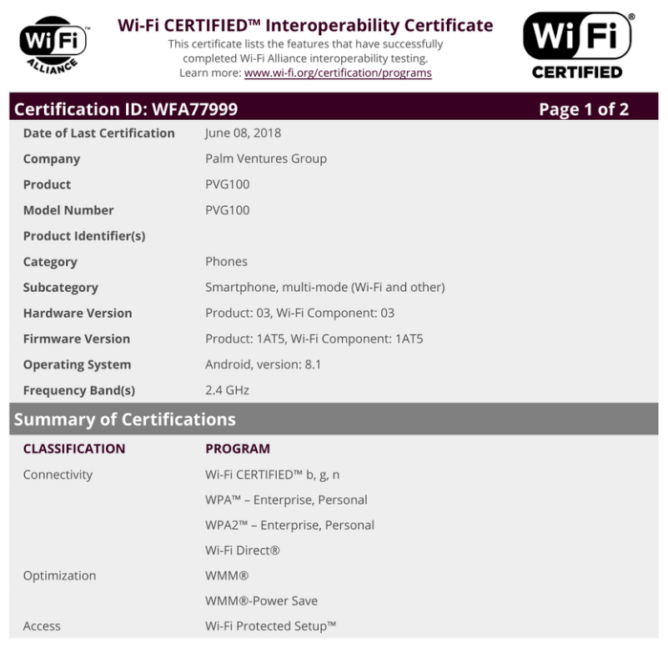 The FCC page is barren aside from the model name and some operating frequencies, but the Wi-Fi Alliance PDF reveals that the PVG100 will run Android 8.1 Oreo. Interestingly, the only frequency band listed is 2.4GHz, meaning that the PVG100 will not have 5GHz. Without 5GHz support, it's unlikely that this device will wind up being very upmarket. Given that we're already well into the second half of 2018, Palm/TCL doesn't have much time to make its deadline of the end of 2018. After all, it already missed its deadline of announcing new Palm devices early in the year. But given these certifications, we wouldn't be surprised to hear more about the Palm PVG100 in the near future.